Model AM - S.P Kinney Engineers Inc. The Model AM is S.P. Kinney’s light-duty Manual Strainer that is similar in design to the Model A. 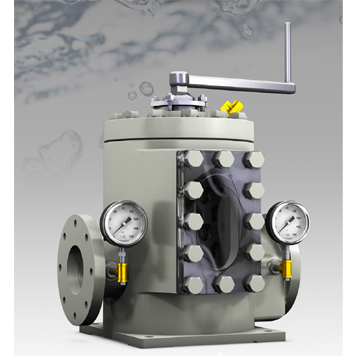 The Model AM is designed for operation where the pressure 20 psi and up. The strainer employs the use of a manually rotated cylindrical drum with a number of threaded holes containing one of many types of straining media. The drum positioned against a vertical backwash slot. 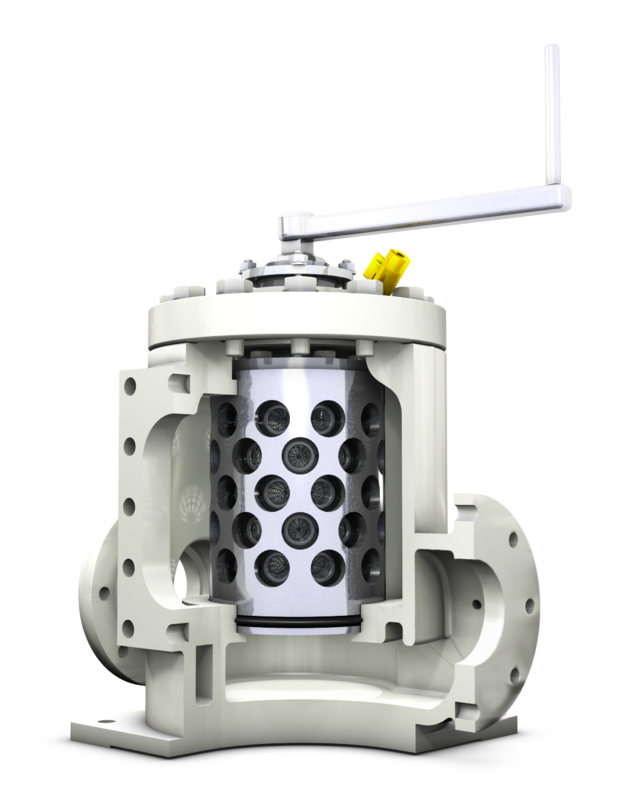 The Model “AM” is a manual strainer designed for removal of suspended particles from all types of liquids. Applications are in industrial plants using river, lake, well, or sea water for cooling, descaling, bearing lubrication, spraying, quenching, and similar purposes. Pipe line sizes: 2”- 4.” Liquids other than water, such as chemicals, acids, white water (paper mills), sewage, and ammonia ﬂushing liquor (coke plants) can also be eﬀectively strained. 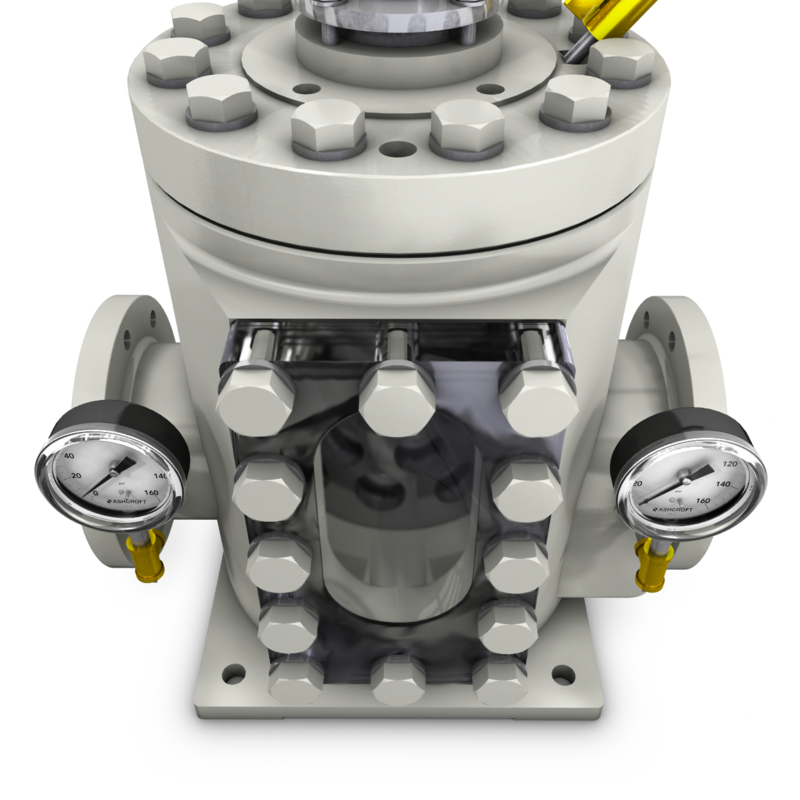 Installation is made on the discharge side of a pump or in any piping system operating under a positive pressure. The minimum working pressure required to eﬀectively clean the straining media is 20 psi. The strainer is compact with small face-to-face width and height dimensions. 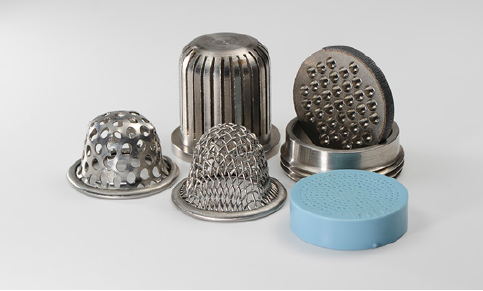 The strainer consists of a straight drum with a number of threaded holes containing one of many types of straining media. The drum is supported on a rotating shaft which can be turned manually with a hand crank in a body having a vertical backwash slot opening adjacent to the drum surface. The drum is manually turned, and as each row of straining media passes the backwash slot a reversal of ﬂow occurs, ﬂushing the suspended particles from the media pockets. This reversal of ﬂow is caused by a pressure diﬀerential between the interior of the strainer and the atmosphere. The backwash ﬂow rate is exceptionally low and will vary, depending on the amount of suspended particles in the liquid. A manually operated valve is supplied for installation on the backwash outlet line to permit intermittent backﬂushing. The clearance between the backwash slot and the drum is equal to or smaller than the opening presented in the media. The backwash slot contains a knife-like edge which enables the strainer to shear debris such as wood, shells, ﬁsh, and other suspended materials that may extend beyond the surface of the drum – with no resultant damage to the drum or the straining media. The Kinney Model “AM” strainer eliminates troublesome disassembly for cleaning and inspection by providing an opening in the side of the strainer body. To inspect the straining media simply remove the cover and manually rotate the drum. As each row of media passes the inspection opening, easy access to the media is achieved.